This air sealing strategy is the key to super efficient homes. Getting high-performance walls relies on proper air sealing before installing insulation, regardless of the insulation used. 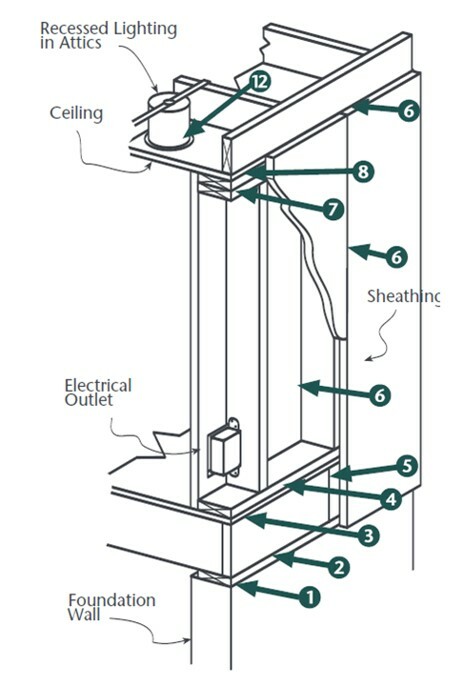 Air sealing is the most critical component of meeting the blower door testing requirement of the Residential International Energy Efficiency Code (IECC) 2012/15. To meet the 3 ACH50 target builders, contractors, and designers must develop an air sealing strategy. This can’t be done without understanding where homes typically leak air to prevent and/or address the top air sealing trouble spots. The typical house is leaky enough to exchange all of its air volume with the outside every two hours. Where do those leaks typically occur? 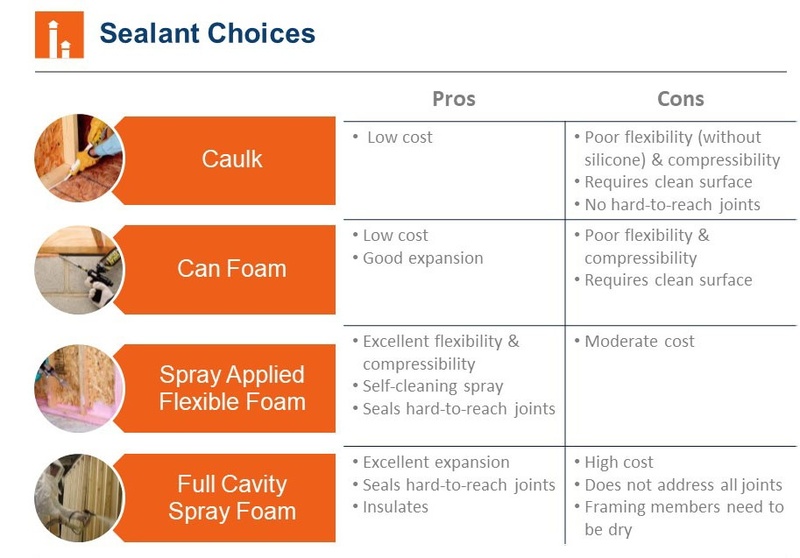 Insulation contractors can use a combination of air sealing products to address air leakage and these products have their pros and cons, as identified by third-party experts (see chart below). But, as we’ve previously covered in our “Air Sealing Like a Boss” blog post, it’s primarily the people and the practices that will be crucial in building an energy efficient and airtight home. Products aside, all the people involved in the construction of a home have a role to play in achieving stringent airtightness targets. Builders, contractors, and/or designers should develop an air sealing strategy beginning with reviewing the building plans and learning about the potential areas of air leakage. Builders should also provide contractors with a checklist of the key air sealing areas and have a quality assurance process to ensure these areas are addressed during insulation installation. Median air leakage for existing homes is 0.5NACH. Residential Energy, Krigger & Dorsi.